Scientific evidence and the occupational health business case were key topics at the American College of Occupational and Environmental Medicine (ACOEM) Conference in Denver in April. 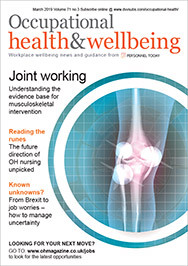 Nick Pahl, CEO of the Society of Occupational Medicine, reports back on the key debates. Can we move from a sickcare system to a healthcare system? Does workplace wellness work? Should occupational health broaden its scope to meet these needs? These are questions I didn’t expect from the American College of Occupational and Environmental Medicine (ACOEM) Conference. Dr Ron Loeppke affirmed the first two questions, saying “random acts of wellness don’t work but evidence-based wellness approaches do”. Change is certainly urgent. Loeppke highlighted a recent Lancet article stating the adolescents of today may be the first generation that will not have a life span as long as the one preceding it. Come and join this multidisciplinary conference for occupational health professionals, organised by the Society of Occupational Medicine and the Faculty of Occupational Medicine. Loeppke highlighted how occupational health can support healthy people and help a healthy bottom line by reinforcing corporate reputation and performance and increasing staff loyalty and morale. Related to this, I’m pleased to say that a new Society of Occupational Medicine report, Occupational Health: the value proposition, outlines the UK evidence for the business case and value of OH. What about the last question – should OH’s scope broaden to, say, include a “public health and beyond” remit? Associate professors at Mount Sinai in New York think so, suggesting OH should work to make an impact on non-medical and social determinants of health. Certainly what we don’t want is silo working, with OH not involved in new “sustainability strategies” that companies are starting on. I can’t see OH colleagues in the UK moving en masse to start their suggested initiatives (such as creating parks and safe and affordable low income housing to support community wellbeing). However, in the past would initiating “healthy eating” have been seen as too far-fetched for OH to consider? My take-home message is that OH services need to state their business case for what they offer and if necessary add how OH can contribute to wider issues such as sustainability and community wellbeing. Looking to the OH of the future, a Yale University academic presented on “using cutting edge informatics tools to enhance occupational health services”. Most US clinicians do use electronic records, but the presentation said “mining” these records in “cloud-based data warehouses” would improve OH services (for example, by reviewing workflow processes for tests such as for audiology and spirometry). Reassuringly, US clinicians do find some IT aspects onerous (such as data entry) and don’t worry if you are behind the curve on this, as it seems a basic audit on good old paper is a good-enough start to get similar insights. We then heard about “fast healthcare interoperability resources” (apple watches, fitbits and other such devices). Analysing individual data (such as air and body temperature) from such devices and the internet should start to inform better clinical decisions both at the individual and population level. A word of warning though – respecting confidentiality in these IT changes is key – so let’s embrace change, but with effective patient data security, be it in the cloud or elsewhere. Here are summaries of other scientific sessions. The importance of healthcare ergonomics to support safe patient handling, particularly for nurses was discussed. In Vanderbilt hospital, 94% of injuries occurred when recommended equipment (ceiling lifts, assistive devices etc) were not used. Nursing assistants also suffer more musculoskeletal injuries than nurses, with half of all nurse and nursing support staff injuries being musculoskeletal (mostly lower back). Improving safe patient handling means asking health professionals to help to buy the right equipment, and using visual cues/posters and continually training/re-training to spread the safe handling message. Top tips were to use slippery sheets, train champions and discuss patient handling during shift changes. Something else to consider is the Mayo clinic’s Bedside Mobility Assessment tool. This all makes business sense with investing in safe patient handling producing savings in less than five years, with more nurses remaining on the job. Industrial hygienists gave their views on oil and gas extraction work safety, in particular exposure to hydrocarbon gases and vapours. There were some shocking examples of deaths of workers who open petroleum storage tanks and it was impressive to see that effective analysis will lead to these deaths ceasing. Despite that, road traffic accidents related to working in the general area where works were under way seemed to be the biggest safety risk. The conference discussed risk factors for low back pain (which affects one in four US workers). A national US study found key risk factors were work-life interference, hostile work environment, job insecurity and high job demands for women, as well as higher risks of developing back pain for older workers and those suffering psychological distress. As regards the role of occupational health and medicine to support workplace pregnancy, while the risks from exposure to the foetus might be low, there is a need for employers to pay attention to the psycho-social needs of women as well as ergonomic and environmental needs. A review of groups who are under-served by OH such as farm workers and seafarers included a session by the Corporate Achievement Award winner, Idaho National Laboratory (which carries out nuclear waste and energy testing, and produce armoured tank protection). The employer tracks absenteeism and presenteeism costs (the biggest cause of which is diabetes). A key win was giving more holiday if workers take less time off sick. Human factors were a big issue and it was reassuring (considering the amount of high-risk material used in the labs) to hear that in reality “the most dangerous place was the parking lot”. Finally, it was a pleasure to see the passion our US colleagues have for OH, which of course we share in the UK. We face similar issues (eg US OH professionals are often asked by the public if they are occupational therapists), although there are differences in challenges and the respective health systems. I am pleased that there is a special relationship between ACOEM and the Society of Occupational Medicine, demonstrated by the ACOEM health achievement award given to Dr Richard Heron (with Dr Loeppke) for their work in setting up the International Occupational Medicine Society Collaborative (IOMSC). This collaborative is helping occupational medicine organisations around the world to develop through sharing best practice, and advocating occupational medicine to governments. To hear more about the US perspective, come to the SOM/FOM conference in Leeds on 27-28 June, where Dr Charles Yarborough, in-coming president of ACOEM, will be speaking. Nick Pahl is CEO of the Society of Occupational Medicine.